"Desegregation of the Dallas Schools was accomplished in the course of ten short years with a minimum of commotion and stress. This may be viewed as just short of miraculous." Desegregation was required by the Brown v Board of Education Supreme Court decision in 1954. Twelve years later this was the public record of desegregation in Dallas as found in a book published in 1966 called "Education in Dallas - 1874 to 1966." The book is in the Dallas Central Library, and several friends have told me they have it. The less than 2 page section on desegregation starts on page 159. The next decade proved the statement quoted above evolved into a great lie! Accommodations is best read with an understanding of DISD desegregation issues and history during these years. DISD Administration has rarely been more wrong in an enrollment prediction than in May and August 1970. In May DISD was predicting as many as 180,000 students by the end of that school year. By August that prediction was down to 177,000 students. 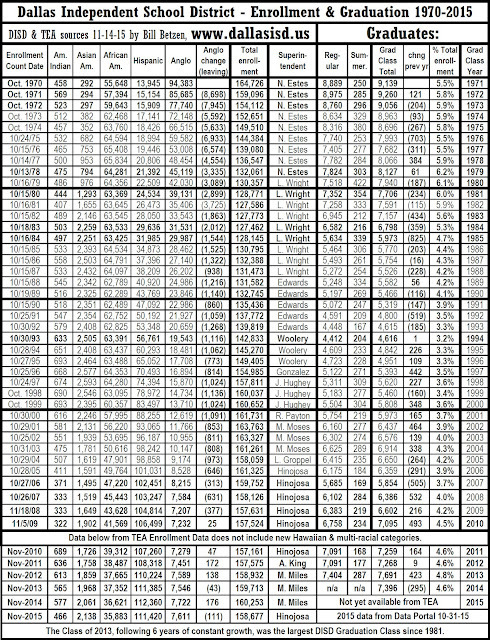 The final full enrollment count for 1970/71 was only 164,726. In 1969/70 DISD had a full enrollment of 173,799 students, the largest annual enrollment ever! DISD thought they would be growing, but then suddenly started to shrink. The loss of White students was for the first time thousands greater than the increase in minority students that had sustained total DISD enrollment growth since 1965. A new stage of White flight began as DISD full enrollment began to shrink. That shrinkage continued until 46,337 students had been lost in just 14 years! The full enrollment of 173,799 in 1970 was down to 127,462 by 1984. 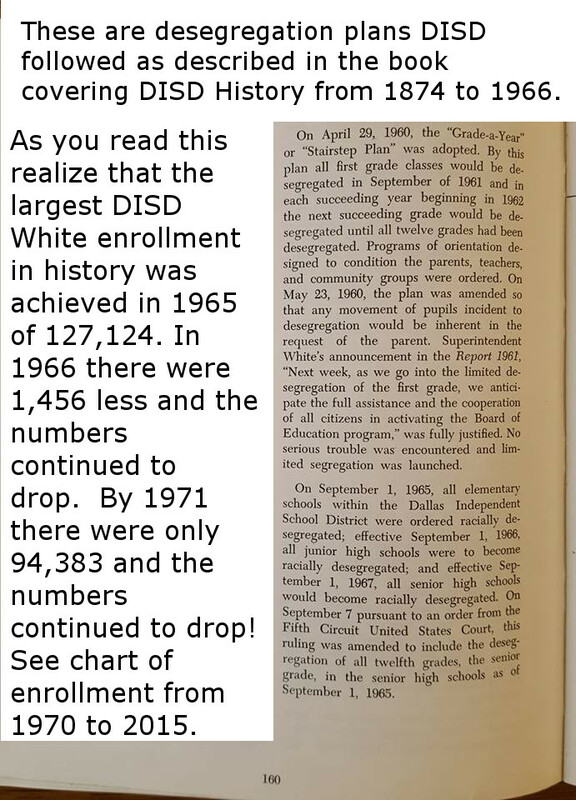 The summer of 1970 was the highest loss of White students in all 44 years of White Flight, 1965-2009, and in all of DISD History! The 1964/65 school year was the highest White enrollment on record for DISD, 127,124. Then White numbers began to decline in 1966, but minority numbers grew faster than the White decline until 1970. Above please find the two pages from a 1874-1966 DISD History describing the desegregation process. Notice the page with cut out to highlight the desegregation process in DISD, and the statistical consequences. Also find below the chart with enrollment by race from 1970 to 2015. White Flight ended in 2009 when White enrollment hit 7,207, the lowest DISD White enrollment in over 120 years. (This is an estimate as I have not yet checked 1889 enrollment numbers from 120 years earlier.) In 2010 White enrollment went up, for the first time in 45 years, to 7,232. White enrollment increases have continued but are tragically concentrated in the best magnet schools, such as the Booker T. Washington Arts Magnet. Often non-minority students from expensive private schools, who were never DISD students, and often do not even live inside DISD, take places that should go to Black and Hispanic students from inside DISD. The Civil Rights battles are not finished! All students must have an equal right to the best education possible! Racial patterns in achievement are still far too common. There is still a well documented pattern of misusing need-based federal funds that are supposed to supplement education for children of poverty, children who do not speak English, and who have other special needs and therefore are allocated such Federal Funds. While these need based funds are properly allocated to the right schools, that increase is used to then replace regular funding that is moved from those high poverty schools to other less needy schools and apparently for other administrative costs in Dallas ISD. A federal complaint was filed 4-21-15 against DISD for the massive supplantation of federal funds that happened under Mike Miles. This is how he was mysteriously able to secure a surplus while funding new programs in DISD. Here is a link to that complaint which is still under active investigation by the U.S. Department of Education, Civil Rights Division: http://schoolarchiveproject.blogspot.com/2015/06/title-vi-complaint-against-disd.html . This complaint was amply covered on the evening news on June 3, 2015 covering also the resignation of the DISD Budget Director. See http://www.wfaa.com/news/local/investigates/budget-director-leaves-amid-questions-of-misspent-disd-at-risk-funds/148904332 . Within 3 weeks, on 6-23-15, Superintendent Mike Miles also resigned. We now know that underachievement by minority children of poverty is NOT necessary. (It is embarrassing to still have to say that in 2017.) We have proven minority schools with adequate resources can do as well or better than any other schools, especially if the students are grounded in their family history and have constantly updated written plans for the future! See recent School Effectiveness Indices scores for Zumwalt and Quintanilla and a report on the Time Capsule Project they are active in. Being grounded in history is always a positive to help improve student achievement. The Dallas White flight was preceded by 29 years during which one of the major Confederate Monuments, and all 5 of the DISD Confederate-named schools, appeared. They were attempts to stop integration and preserve a segregated community and school system. Over 152 years have passed since the Civil War. Why was it only during the 29 years of the fight to defend legal segregation, just before it was declared illegal, that Confederate names were appearing? Can anyone believe honor for Civil War Heroes was the main reason? What happened to that honor before 1927, or since 1956, in Dallas? On Sunday 8-6-17 another article by a group wanting all Confederate Monuments destroyed or moved identified an additional 6 names on DISD schools of people who served in the Confederacy in various forms that they think should be changed. That would have made for a total of 11 such schools in DISD, two with the names already changed. I question how many of these additional 6 are identifiable to the public as Confederate Heroes, but this would be a great issue for our students to research and vote on. The potential for this as a learning exercise for our students is very high. There are people trying to destroy the evidence of the manipulations done with Confederate Monuments instead of adding to these raw evidence from history with a Monument to Education telling more of the entire story. We must use this evidence of abuse in relatively recent times to tell a much more complete Dallas History at the same locations where Confederate Monuments are now. See http://billbetzen.blogspot.com/2017/08/confederate-monuments-as-education.html . William Murchison and those arguing to preserve Dallas Confederate monuments are right, but for the wrong reasons. They argue about the value of Civil War History. Any message these monuments have about Civil War History is greatly overshadowed by the message they have about Dallas History. The Civil War is only a part of that message. What was happening in Dallas as these Confederate names and memorials were dedicated from 1927 to 1956 is the reason they must be preserved. The issue is education about Dallas History! These monuments tell the story of the at-times violent struggle as Dallas was pushed toward ending "Separate but Equal." This evidence must not be destroyed or hidden but must be moved out of places of public respect and into museums that can properly tell a very painful history surrounding these statues. It must be done in an accurate historical context reflecting the suffering they were used to justify and continue. The rest of Dallas History is reflected in the abusive segregation these monuments were intended to continue! The first Confederate Monument, and the largest in Dallas, was more definitely a memorial. Many Civil War Veterans were at that 1897 dedication. That was less of a reality at the 1936 dedication of the Lee Statue dedicated within that 29 year period from 1927 to 1956. This time period was when 5 easily identifiable Confederate names, plus 4 other names of leaders who served in the Confederacy, were given DISD schools. This was allegedly to remember a war that ended in 1865, 62 years before the first Dallas school was given a Confederate name. The same process happened in most southern cities during roughly the same 29 year period leading up to the end of legal segregation. If these were really attempts to honor Civil War heroes across the U.S., why only during this 29 year period out of the last 152 years? These reminders of Confederate History were used to intimidate minorities in the fight to keep our cities and schools racially segregated. That fight was becoming more intense since the 1909 founding of the National Association for the Advancement of Colored People, the NAACP. Within four years the NAACP was first mentioned in the Dallas Morning News. In 1929 the Dallas Chapter was founded. By the 1950's the NAACP was in the news monthly. At the same time, opposition to the NAACP thrived. In 1923 the KKK Texas Fair Day set attendance records for any weekday up to that time. That night 6,000 new KKK members joined. In 1927 the first two Confederate-named DISD schools opened: Robert E. Lee Elementary and Sidney Lanier Elementary. By 1929 KKK membership was declining with the active help of the Dallas Morning News reporting on the violence. Another group was taking over with less violent tactics for the same goal, the Dallas White Citizens Council, now the Dallas Citizens Council. In 1936 the Robert E. Lee Statue was dedicated. Stonewall Jackson Elementary opened in 1940, Jefferson Davis Elementary opened in 1952 (renamed Barbara Jordan in 1999), and finally John B. Hood opened in 1956 (renamed Piedmont in 2016.). In 1966 a book titled "Education in Dallas, 1974 to 1966" was published with a very unusual report on the desegregation process in Dallas ISD. 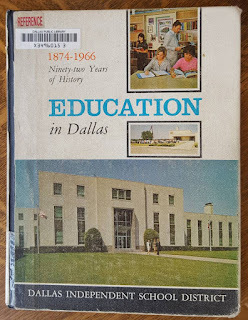 It said on page 159: "Desegregation of the Dallas Schools was accomplished in the course of ten short years with a minimum of commotion and stress. This may be viewed as just short of miraculous." But as this book was published in 1966 White flight started in Dallas Public Schools. The record 1965 White enrollment of 127,124 dropped by 1,456 in 1966, beginning a 44-year process of loss with the largest loss being over 9,000 White students in 1971. 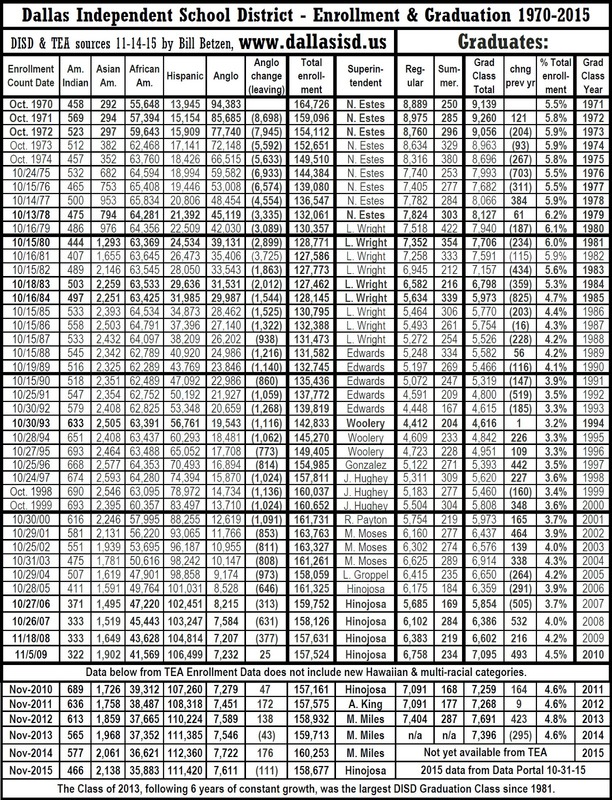 By 2009 White Flight stopped with only 7,207 White students left in DISD. 120,000 White students had left. 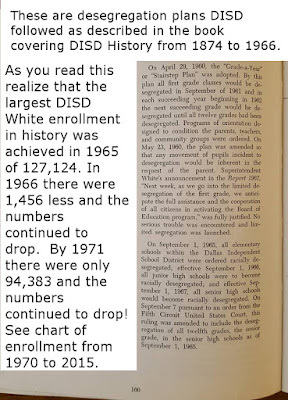 During White flight the highest total DISD enrollment was 173,799 in 1970 and the lowest was 127,462 in 1984. These monuments say much more about the local wars before integration was legally required in Dallas than they ever said about the Civil War. They reflect Dallas leaders fighting to preserve a segregated Dallas, failing, and the White flight that followed. Now within a decade of White flight ending there are plans to move, change, or otherwise hide the Confederate memorials and names. It is like covering up all the “Colored Only” signs at the water fountains in the Records Building. It is hiding the heritage of abuse too many in Dallas are still forced to suffer, either as perpetrator or victim. Some want to lie about it and claim it never happened. Others are angry about those lies. Either way, we are suffering. Denial is not the way to heal. Hiding Confederate memorials is not the way to heal. Both the monuments and the name changing process in our schools can become roads to education and healing. Students in every Confederate-named school should first vote about the name change. This is a learning opportunity. Students must know the segregated schools these names were intended to defend. A super-majority of 80% of students should be required before the name can change. Until then the lesson has not been learned. Do not rush name changes. This will be a lesson that students study over several years. They will remember what a super-majority is also. This is also an opportunity for students to study history. On Sunday 8-6-17 the Points section had a front page article titled "Dallas' Confederate memorials scream 'white supremacy'" in the online version, by Professor Michael Phillips and Edward Sebasta. It was an excellent article about the true meaning of these memorials. That article named an additional 6 schools in Dallas whose names I had not noted. One of those was from 1913, Oran M. Roberts Elementary. Another was from 1981, John H. Reagan. I question the public identifying all 6 of these names as "Confederate" representatives, though they did serve in the Confederacy, but this would be an excellent issue for our students to form opinions on and vote about as they get to know the people for whom their school was named after. At the Confederate Monuments Dallas must allow historians and artists to compete to show a more complete Dallas Civil Rights History. It is overdue! New monuments must interact with the old, affirming progress made against segregation. The ongoing equality struggle must be shown as both victorious and still active. History is the best tool. Dates and facts must be posted at the monument that are not yet well known in our history but that clearly indicate these truths. Is Dallas strong enough to post more dates and facts from this painful time on a new Monument to Education near the Lee Statue on an identical, but taller, base in Lee Park? An integrated 6th grade class and their teacher, identical in design to the Lee statue but 20% larger in scale, would be standing on the new monument base looking at the Lee statue. The Black male teacher appears to be speaking, maybe about history. The gaze of General Lee would be focused on a Black male student in the class. The teacher would be looking down at Lee and gesturing toward him respectfully. Reverend Peter Johnson, the organizer assigned to Dallas by Dr. Martin Luther King in the 1960’s, has agreed to allow his image to be used as the teacher. He is now teaching a Dallas Civil Rights class at UNT-Dallas. The focus by Robert E. Lee on the Black male student in the Monument to Education would affirm the sentiment Mr. Murchison wrote about regarding the healing Lee sought after the Civil War.